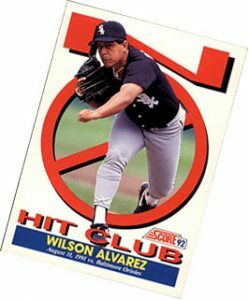 Wilson Alvarez threw a no-hitter for the 1991 Chicago White Sox in just his second major league start, 26 years ago today. Alvarez, a 6-foot-1 southpaw from Maracaibo, Venezuela, no-hit the Baltimore Orioles on August 11, 1991, walking five and striking out seven. His outing at Baltimore’s Memorial Stadium went considerable better than his major-league debut, in which he left the game after facing five batters without getting a single out. On July 24, 1989 as a member of the Texas Rangers, Alvarez yielded a leadoff single to Junior Felix and then served up back-to-back homers to Tony Fernandez and Kelly Gruber. Bobby Valentine pulled Alvarez after the southpaw issued back-to-back bases on balls to George Bell and Fred McGriff. Alvarez went on to carve out a 14-year career, posting a 102-92 record with a 3.96 ERA. He retired in 2005 as a member of the Los Angeles Dodgers. Also throwing a no-hitter on this date is the Boston Braves’ Vern Bickford, who no-hit the Brooklyn Dodgers at Braves Field on Friday, August 11, 1950 for a 7-0 win.